It's tempting to add a baby bunting bag to your baby's stroller or car seat, especially during the colder winter months. Since baby bunting bags are sold at major retailers, they're mainstream and often thought of as safe for your baby. But before you tuck your baby into a seemingly safe bag, consider the possible dangers. In fact, the Canadian Paediatric Society specifically warns against using baby bunting bags at all, opting for a safer alternative keeps your baby warmer and lowers risk of suffocation. Bunting bags are used as a way to keep baby warm while taking car trips in the winter. They can be used with the car seat, with slots for straps to anchor the bunting to the seat. Other, more modern bunting bags are used in swaddling baby during sleep. They fasten securely around baby's arms with Velcro for a quicker, more secure method of swaddling for babies who prefer to be swaddled during sleep. 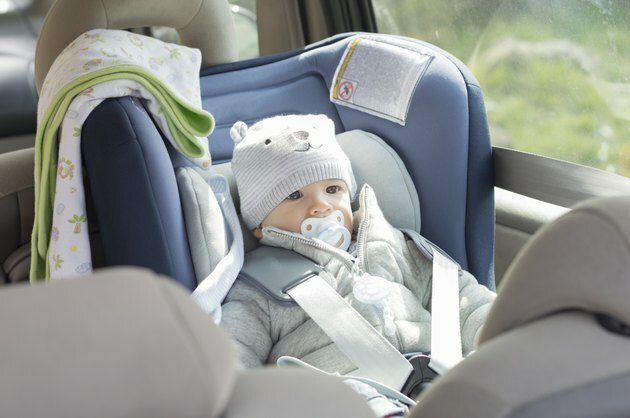 When it comes to your car seat, major car seat manufacturers agree that you should never add aftermarket add-ons, such as bunting bags, to their seats. Doing so voids that warranty, since bunting bags have not been tested for safety with the car seats. Besides posing a safety risk in the car, a bunting bag can be a suffocation hazard. If a soft bunting bag covers your baby's nose and mouth, it could quickly lead to a loss of air and even death. Avoid using a bunting bag with a car seat. Instead, tuck a thin blanket around your baby's shoulder securely for warmth and to reduce the risk of suffocation from thicker bunting. If you are using a modern bunting bag for swaddling during sleep, do so by supervising your baby constantly to ensure that the bunting doesn't unfasten and become a suffocation hazard. In some cases, baby bunting bags are used specifically for babies with special needs, but they are tested and deemed safe by the American Academy of Pediatrics before being used. A receiving blanket or other thin blanket can be safer than a bunting bag in a car seat, but can still pose risks if used improperly. Always tuck a blanket tightly around your baby. If your baby prefers to have his hands free, tuck the blanket around his torso rather than his shoulders to prevent the blanket from becoming untucked. If using a bunting for sleep, choose one that has holes for both the head and arms and is more like a shirt than a blanket. This ensures your baby stays warm without posing a suffocation hazard.